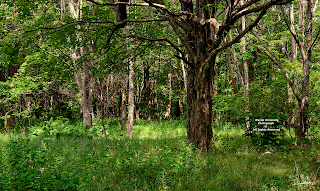 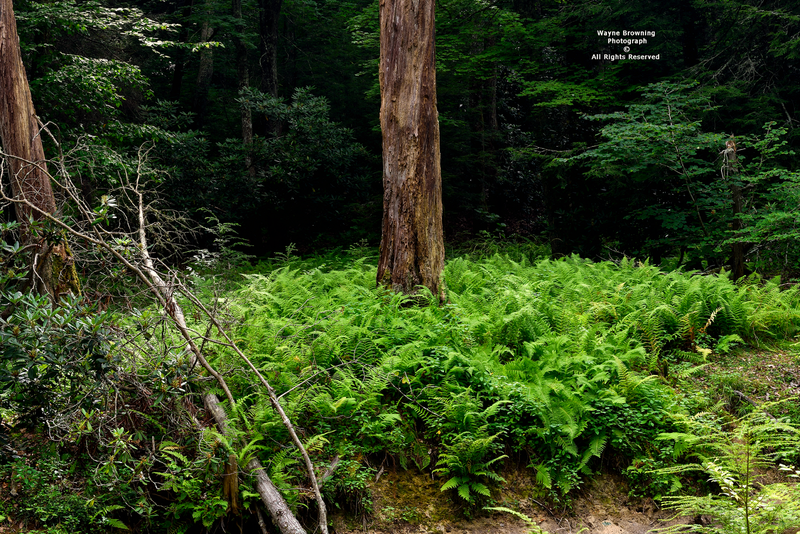 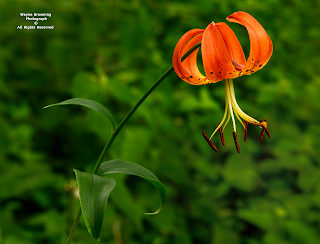 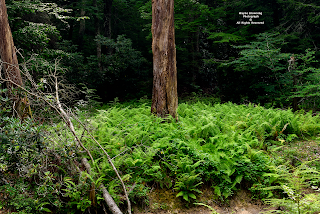 ( along northern slopes ) to 78 degrees in the open expanses of the Big Cherry Wetland Valley. 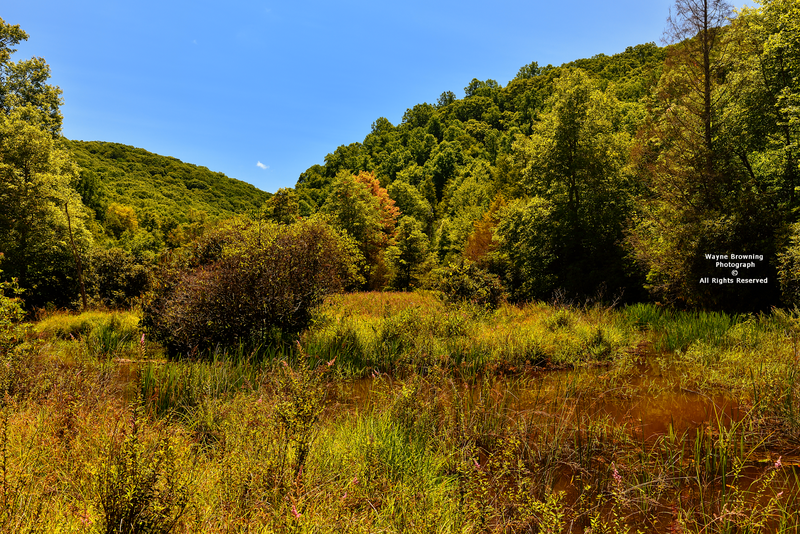 Although coolest nights occurred in the open expanses of the Big Cherry Wetland Valley during July, the coolest mean temperatures were observed in the head of the valley ( 65.2 degrees recorded at the Big Cherry Wetland 2 site ). 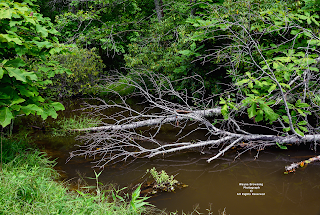 The average Summer 2017 minimum temperature at the Big Cherry Wetland 4 recording site for the June 1 to August 5 period was 51.5 degrees ( ** ). 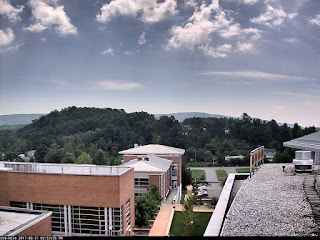 **A minimum of 49 degrees was recorded on the morning of August 5 with even cooler conditions into August 6 to continue the chilly nights. 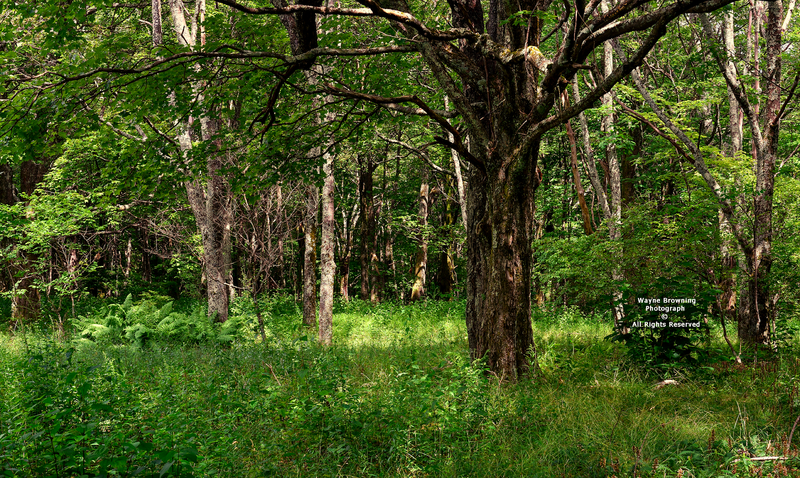 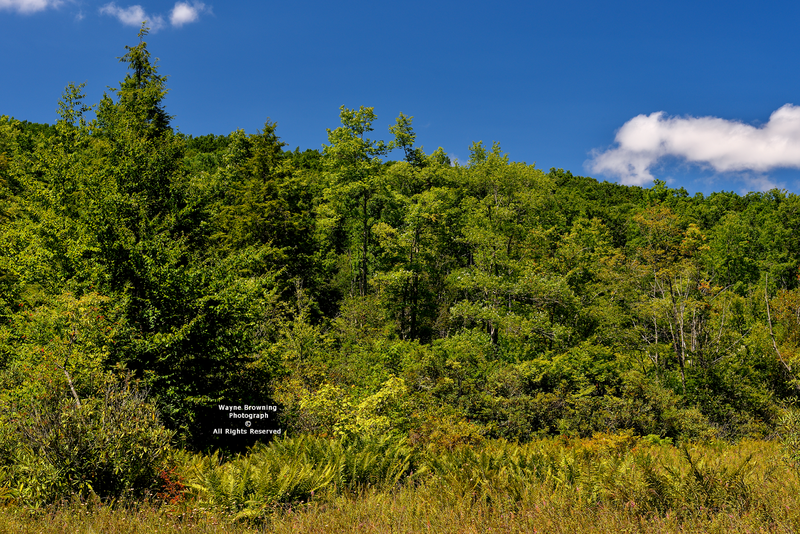 A few maples along the valley floor were showing some early color changes on August 5, which was not dryness related. I measured 1.40" of rain in the gauge at Big Cherry Dam for the August 4-5 period ( around 2.00" fell on Eagle Knob during the August 1-5 period ). within and along the wetland valley. 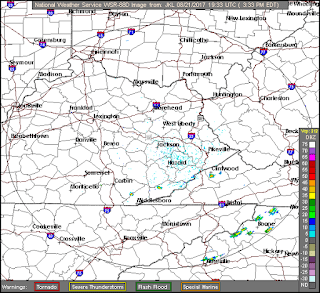 rainfall event generated hefty amounts. 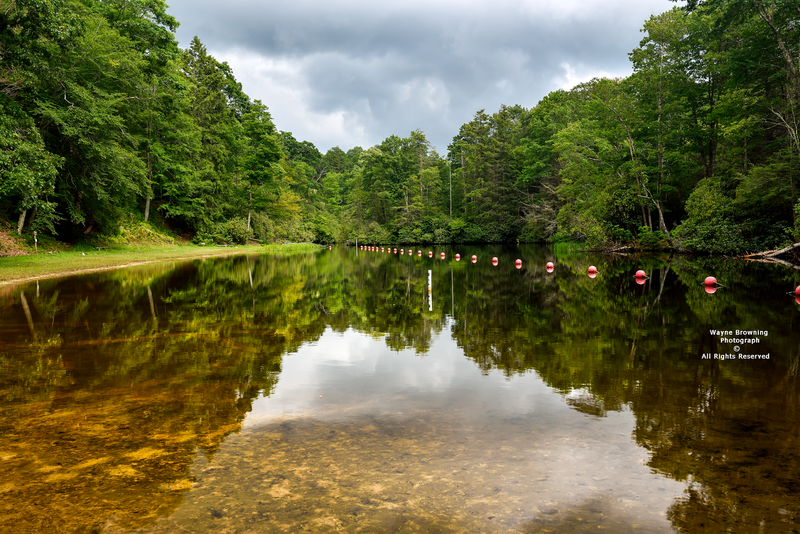 Superintendent Andrew Greear reported 2.64" of rain during August 6-7 at the City of Norton Water Plant ( 3.53" in August and 40.75" during 2017 ). 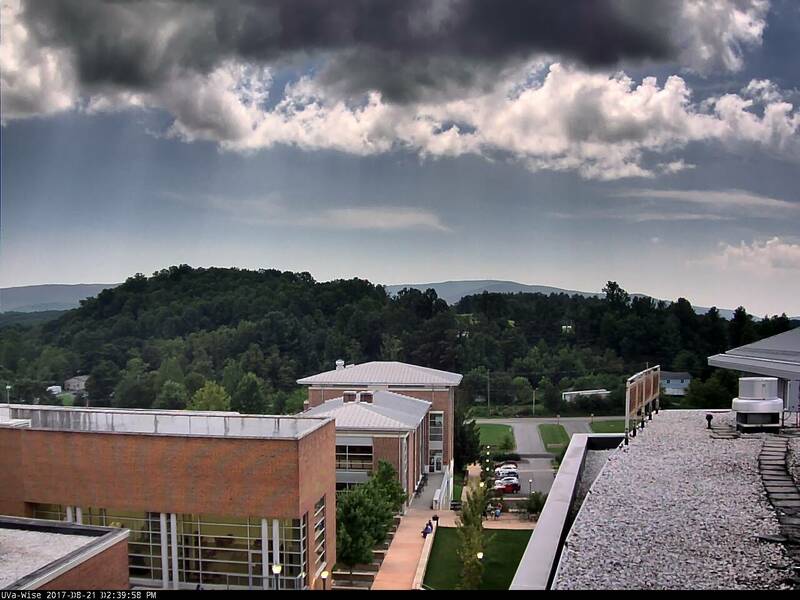 *More than 3.00" fell at the summit level of the High Knob Massif to boost the August 1-8 rainfall total into the 4.50"
to 5.00" range on Eagle Knob. 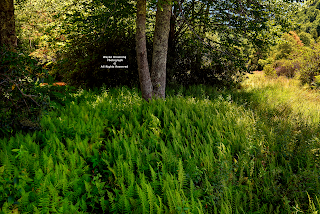 *Approximate total ( some missing data ). 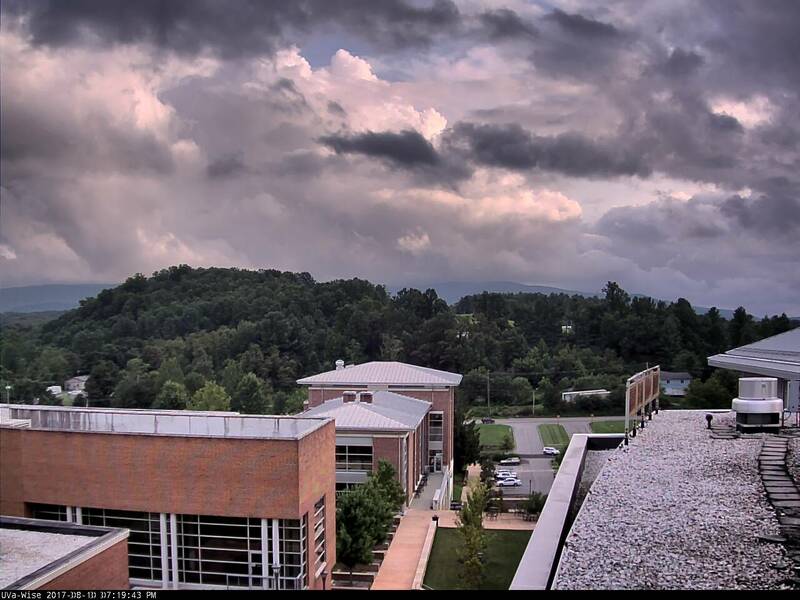 Andrew Greear and Joe Carter report 7.39" of rain so far during August at the City of Norton Water Plant ( 16.04" summer / 44.61" in 2017 ). Big Cherry Dam ( 16.31" summer / 52.11" in 2017 ). *Totals for this year are based upon NWS hand-measured, and automated gauges, as well as snow core data from the winter. 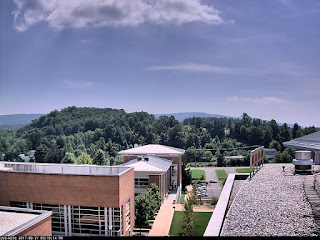 The following documents this solar eclipse as it appeared from the University Of Virginia's College At Wise. 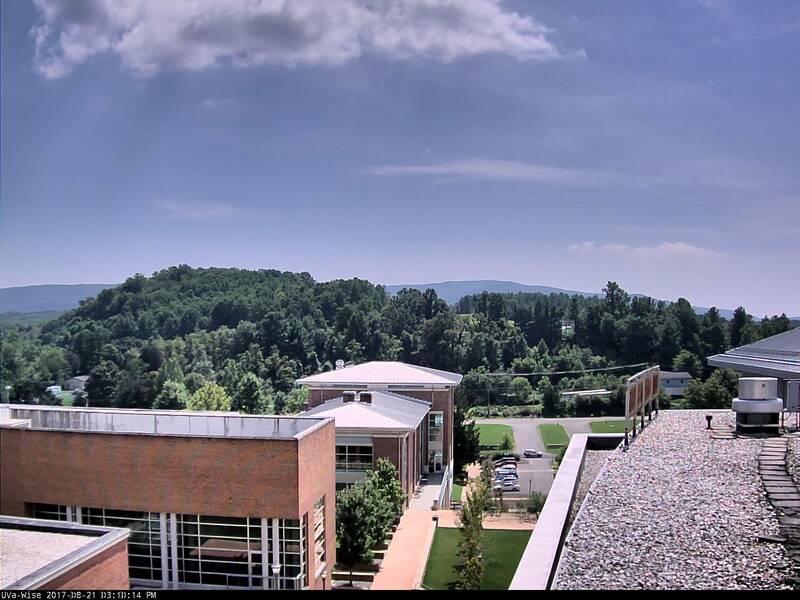 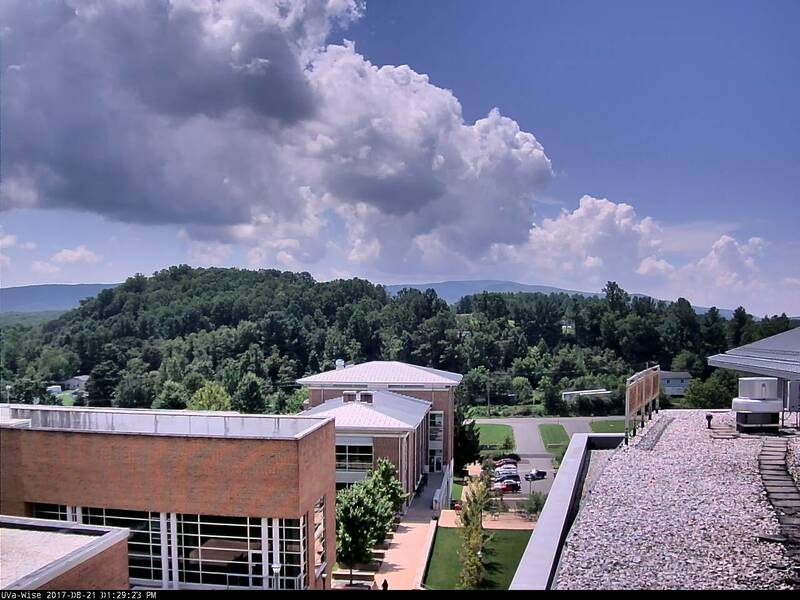 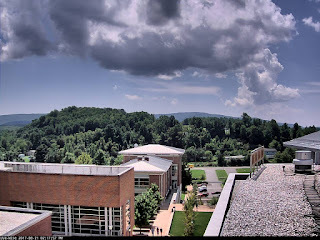 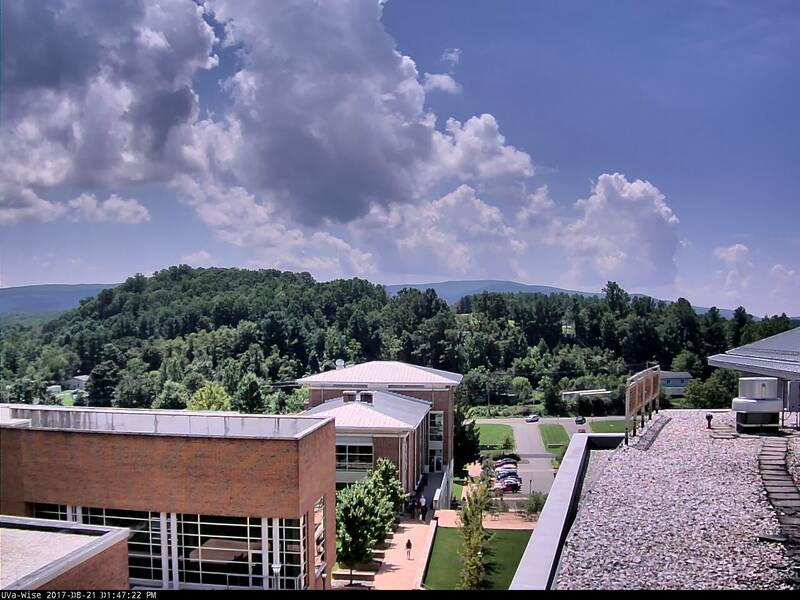 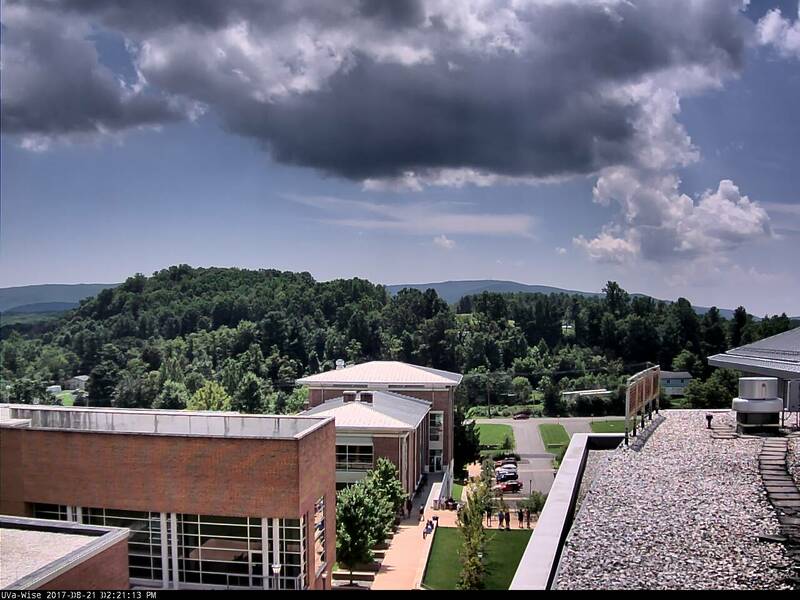 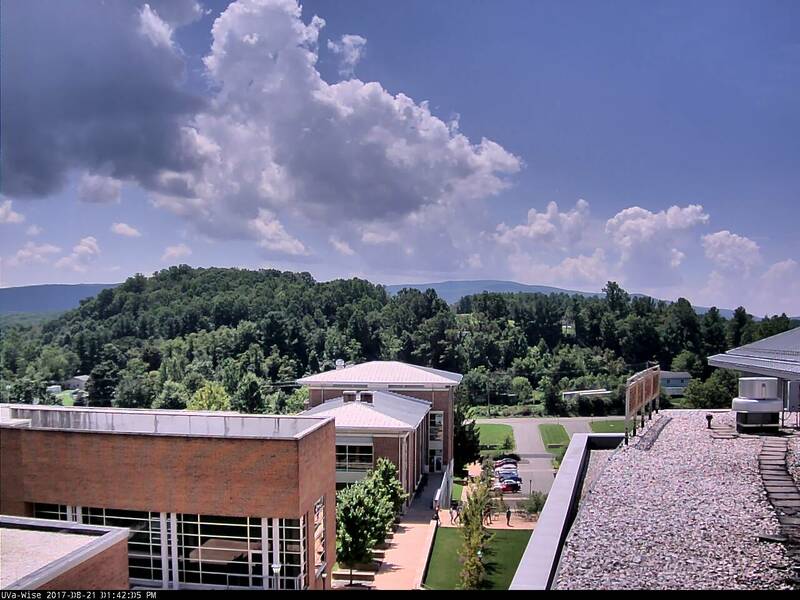 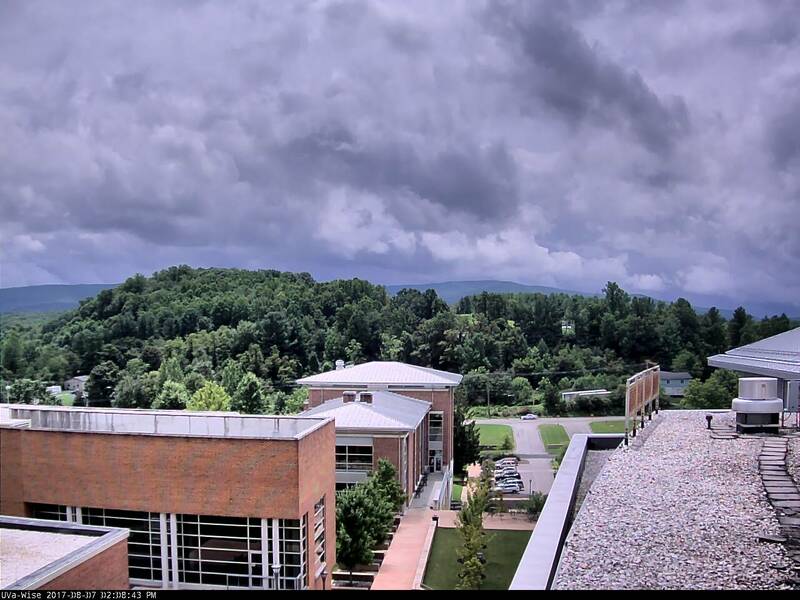 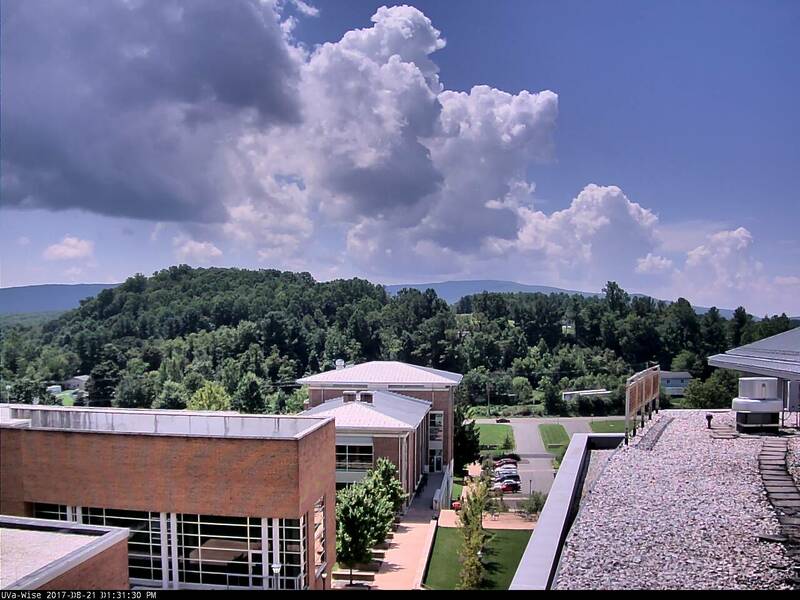 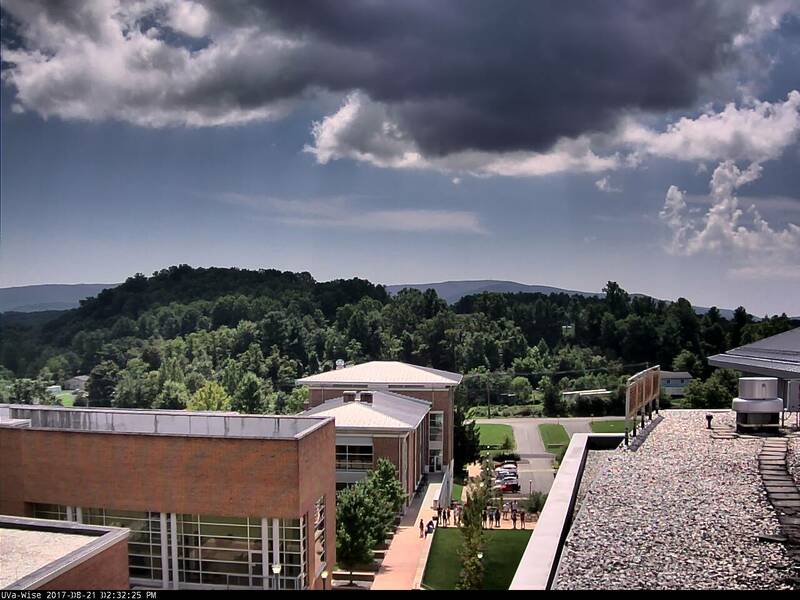 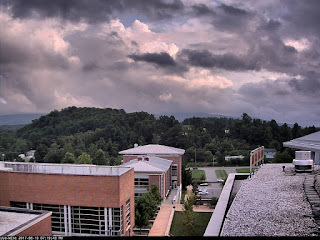 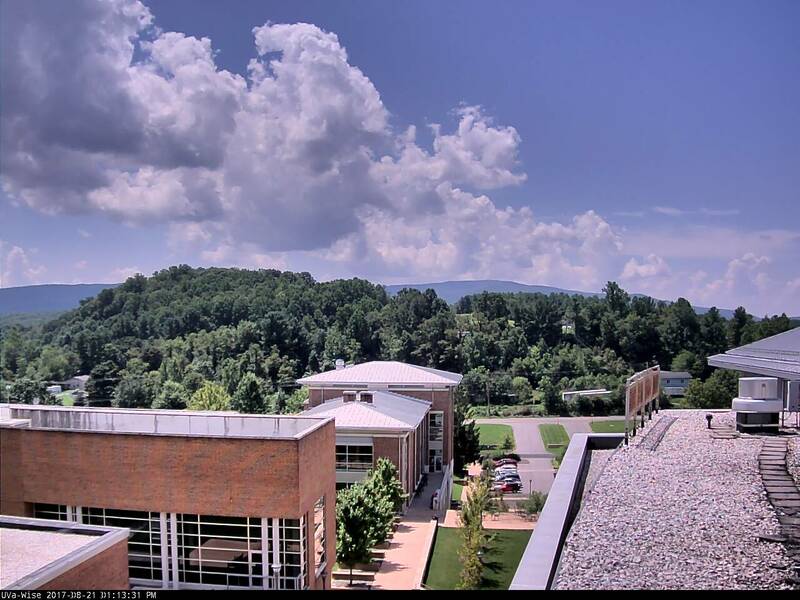 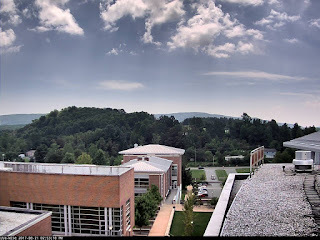 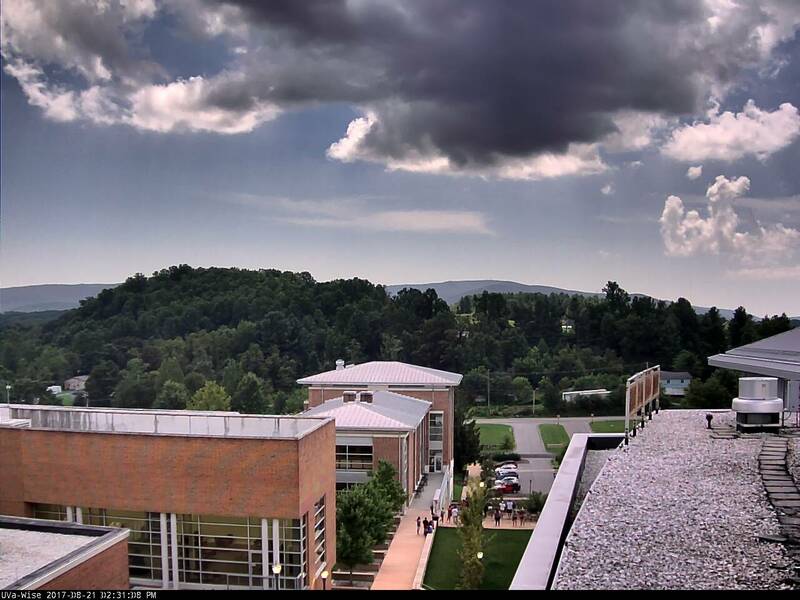 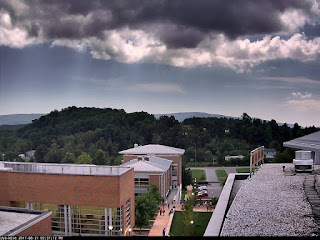 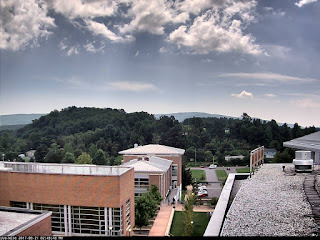 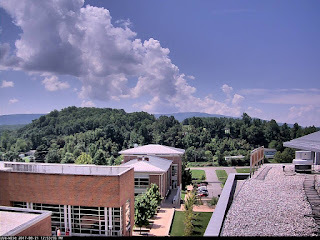 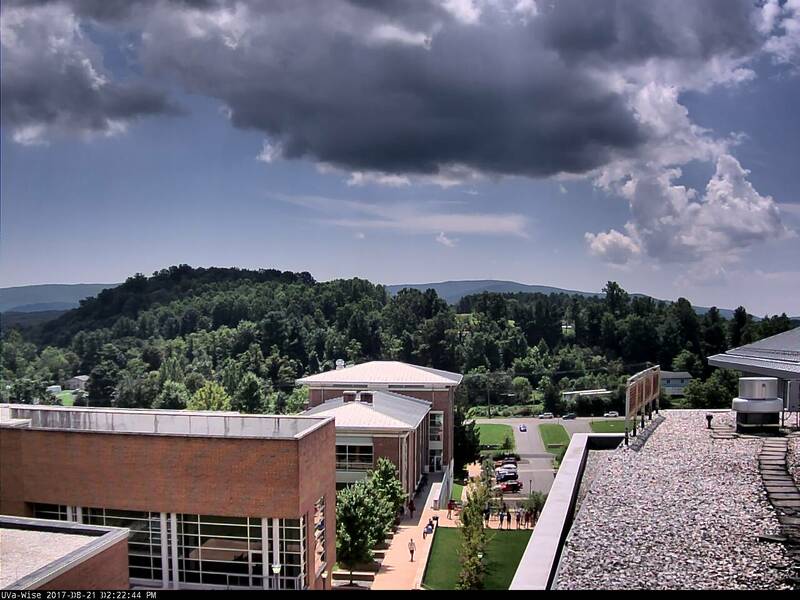 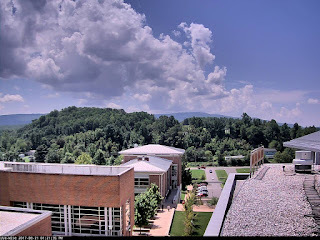 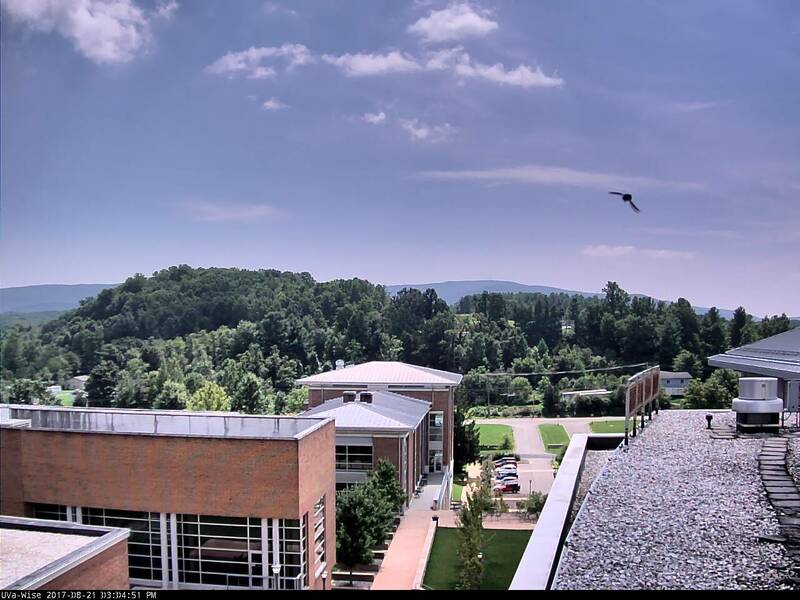 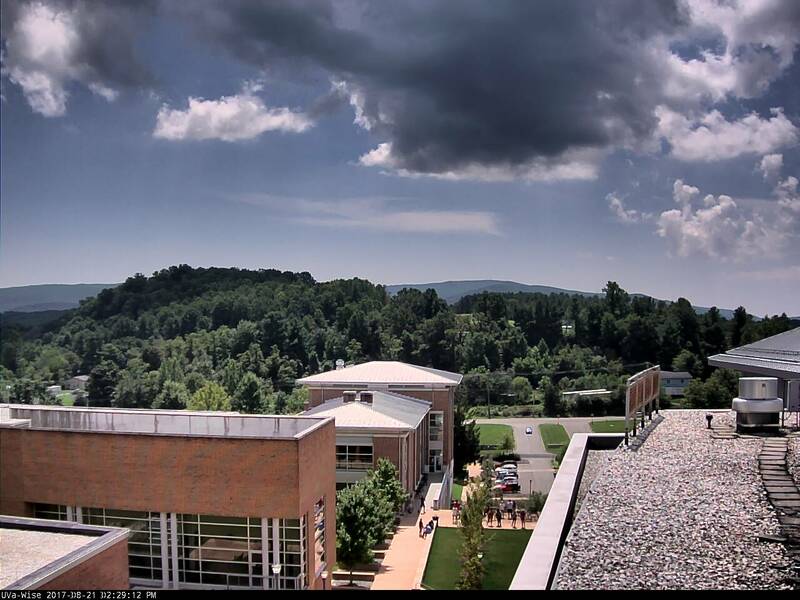 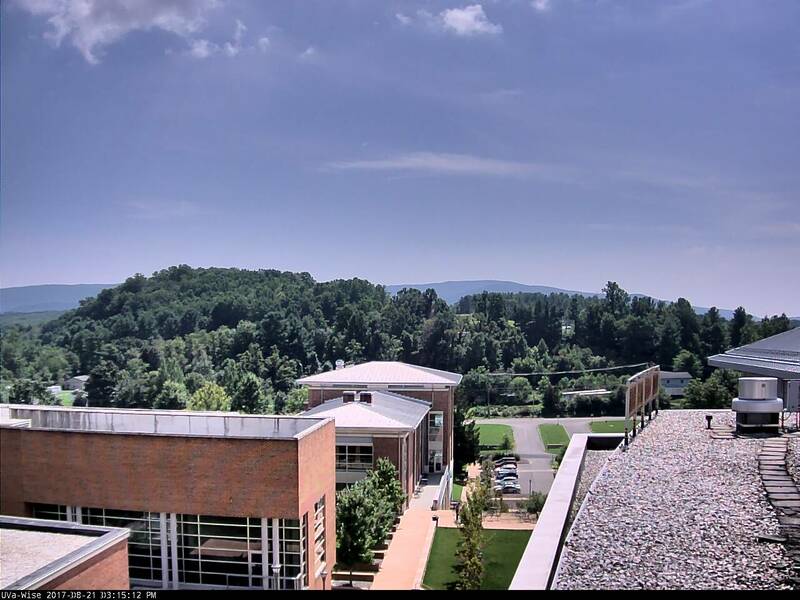 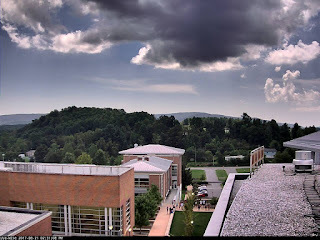 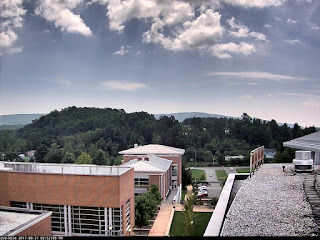 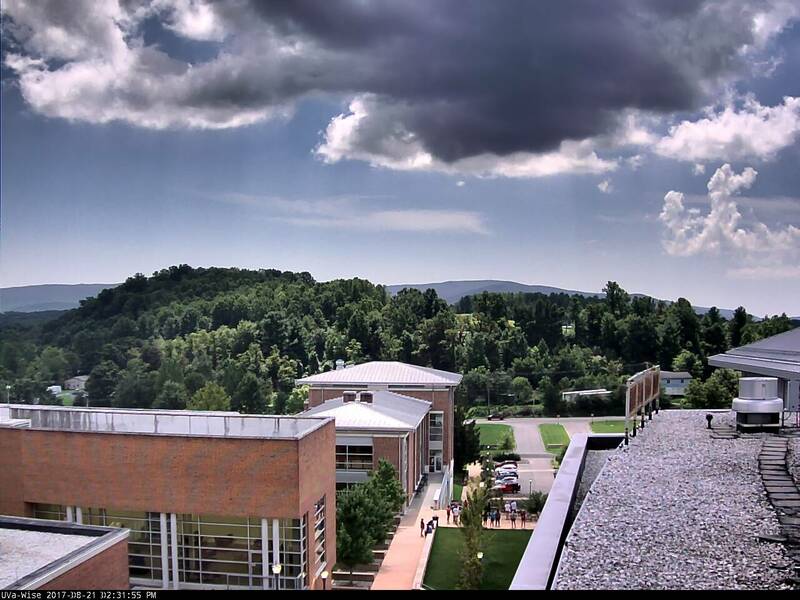 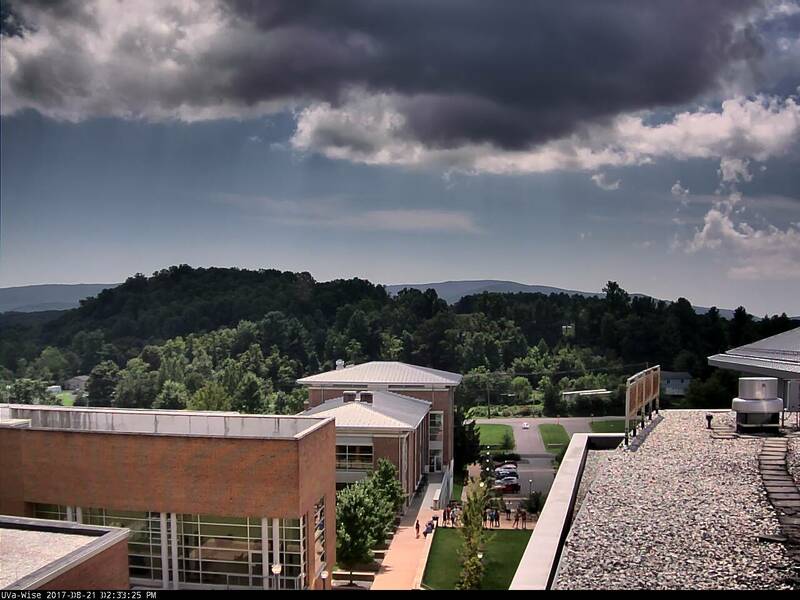 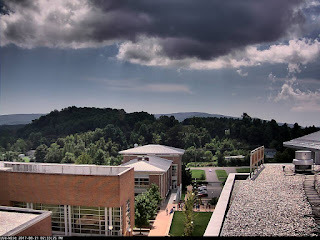 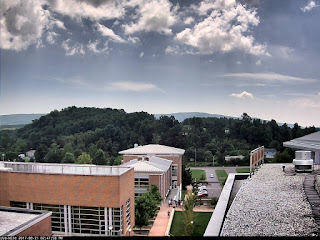 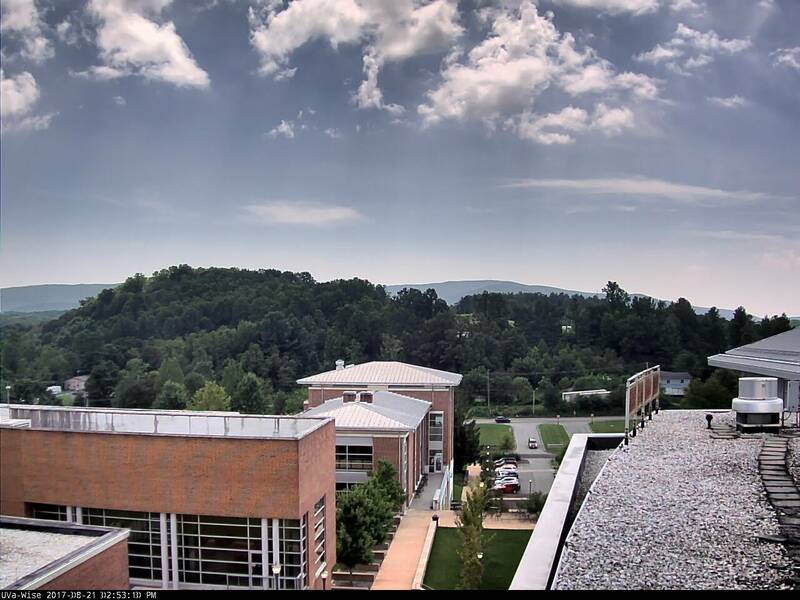 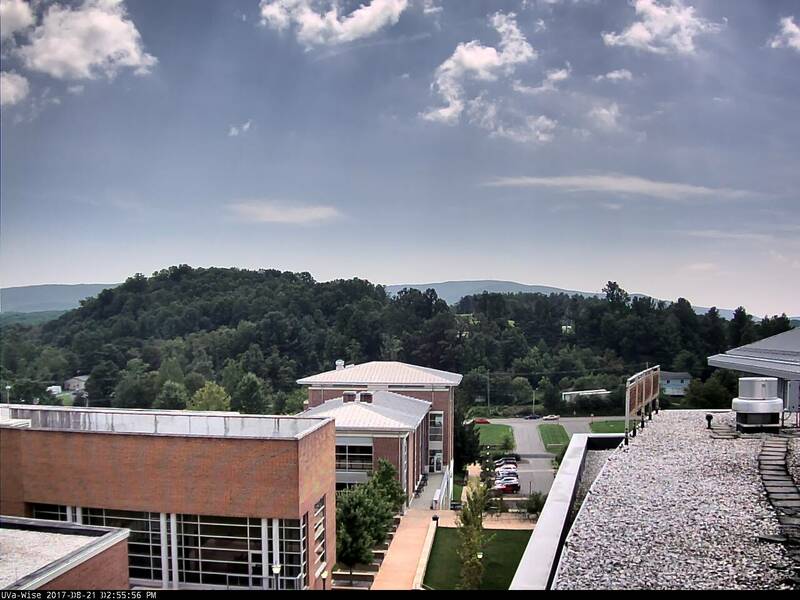 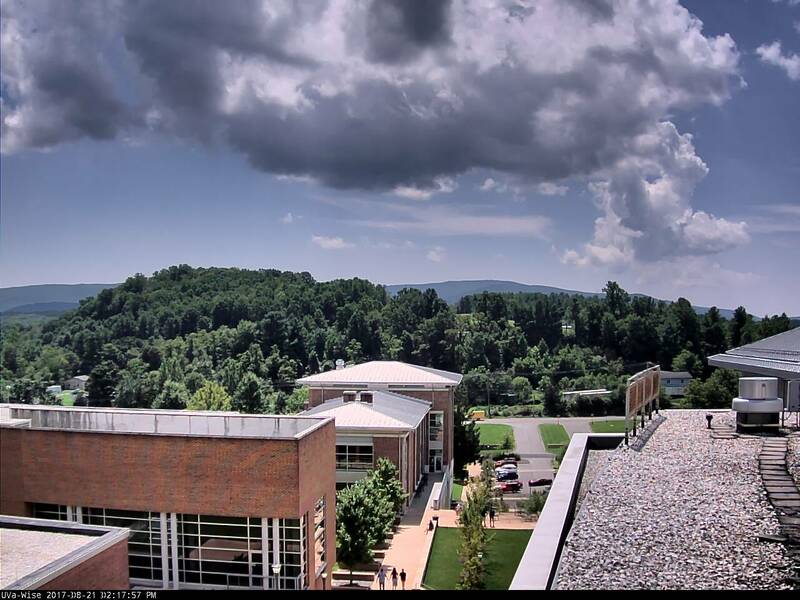 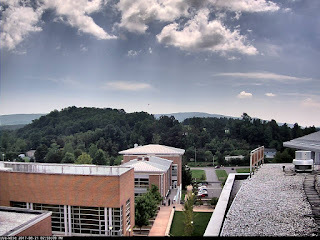 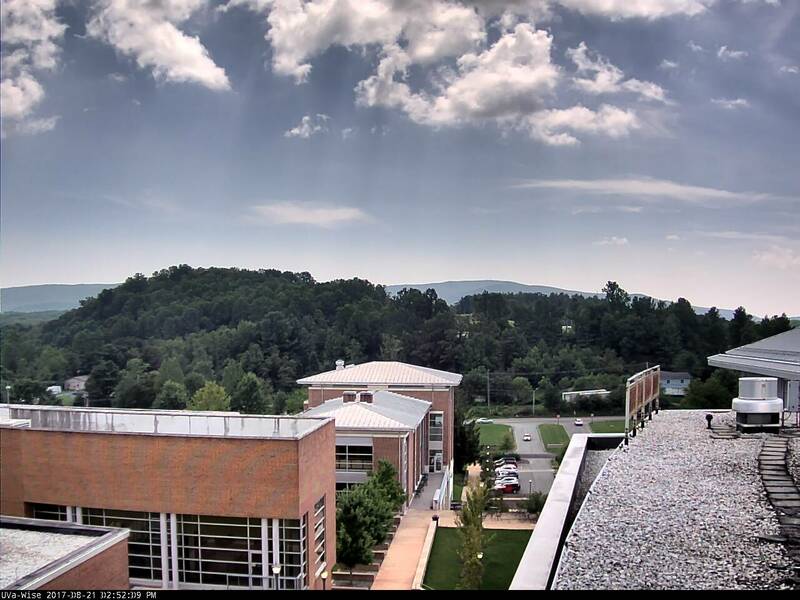 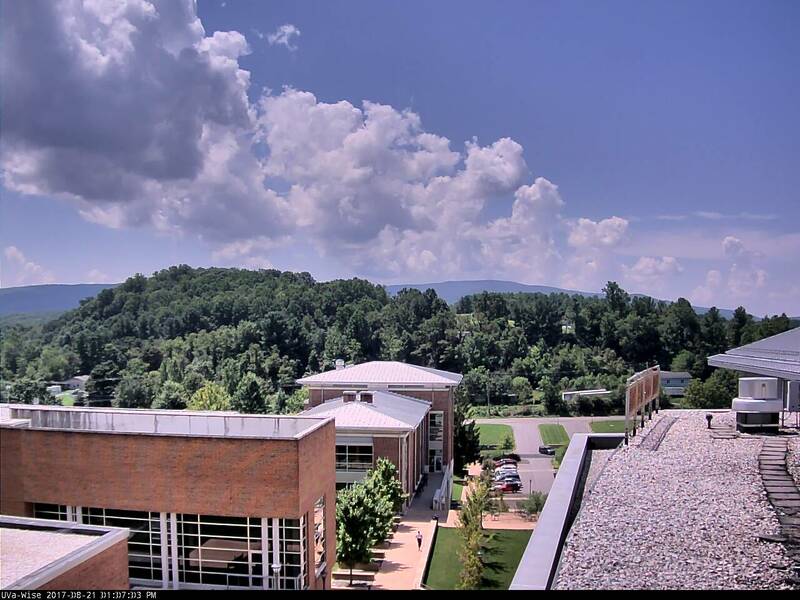 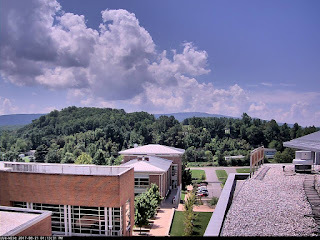 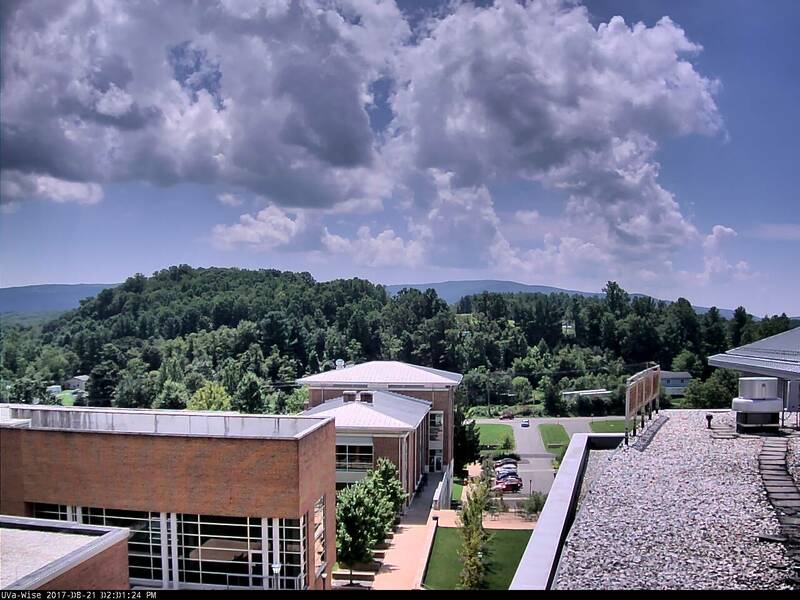 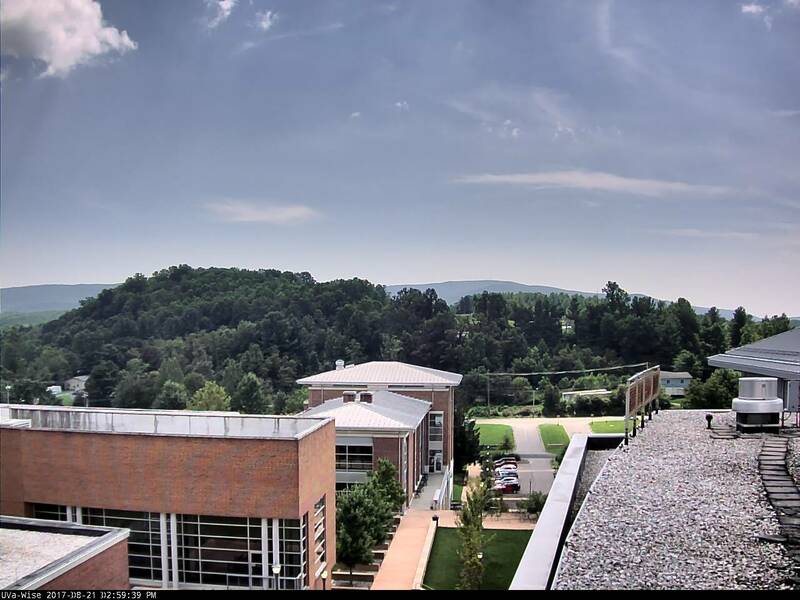 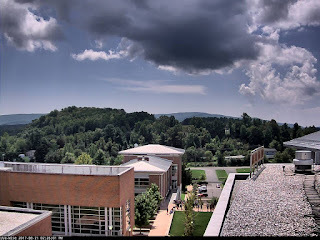 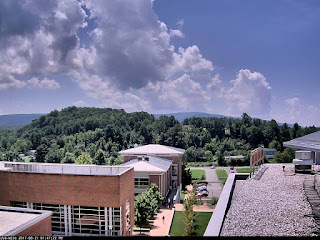 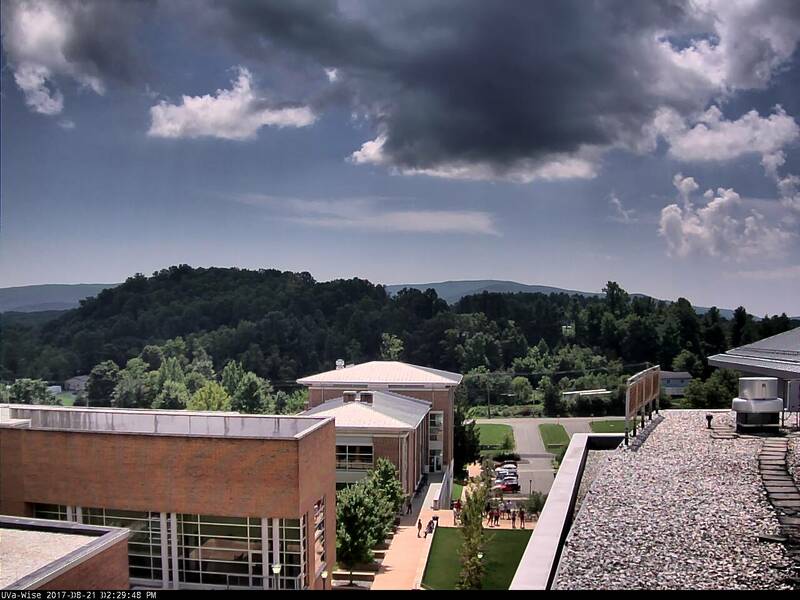 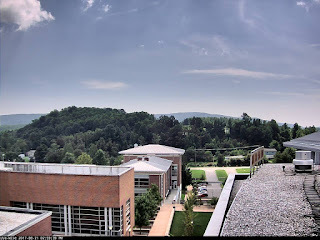 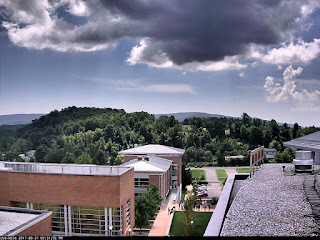 Viewed from the High Knob Massif Web- Cam on top of the Computer Science building. 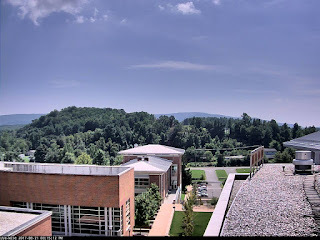 block out the huge sun? Well it has to do with positioning and ratios. 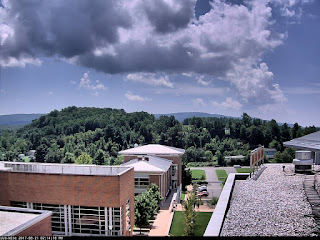 The numbers at this point in space & time! The diameter of the sun is 400 times larger than the moon, but it is also 400 times farther away from the Earth than the moon. 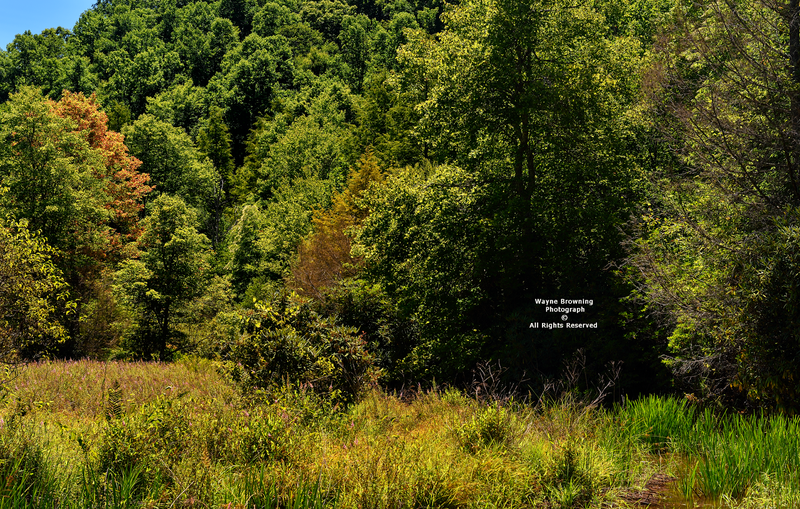 So from Earth the moon and sun look about the same size at any given time, since 400 divided by 400 equals 1. 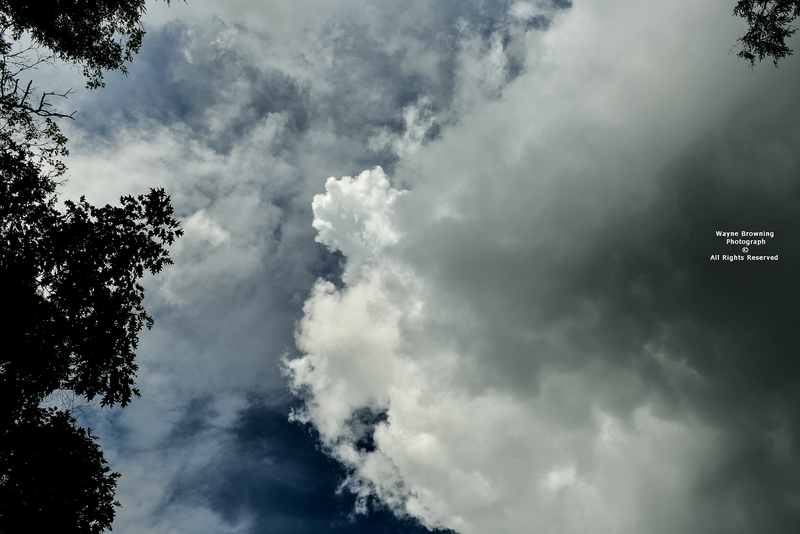 In 1-2 million years from now, such will not be the case and total eclipses will no longer be possible on Earth ( i.e., the numbers will no longer divide to generate unity or 1 ). The sun was covered by clouds in parts of the area, blocking the view, yet the scene remained majestic with interesting rays of sunlight ( crepuscular in nature ) streaming around the edges of very dark cloud bases. An amazing aspect was how much light only 4 percent of the sun's irradiance generated, as only beneath 100 percent totality did it ever become truly dark. 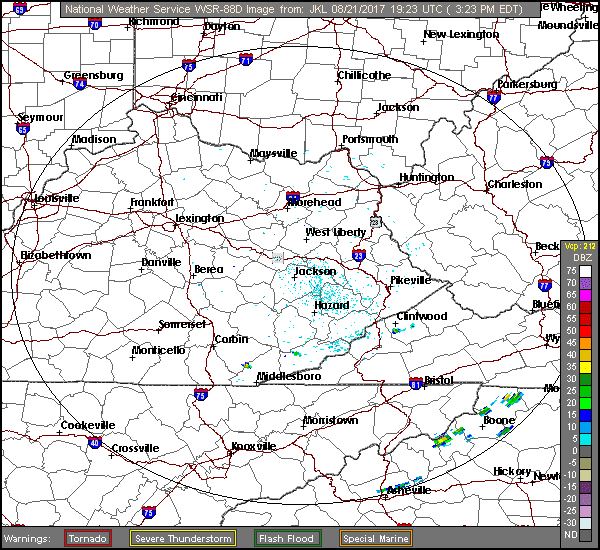 Although atmospheric cooling during the eclipse stablized many places, it was not long until a few isolated downpours developed ( near and just southeast of Clintwood ) across the region. 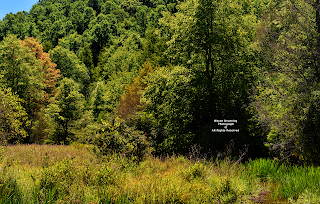 of dense river valley fog. 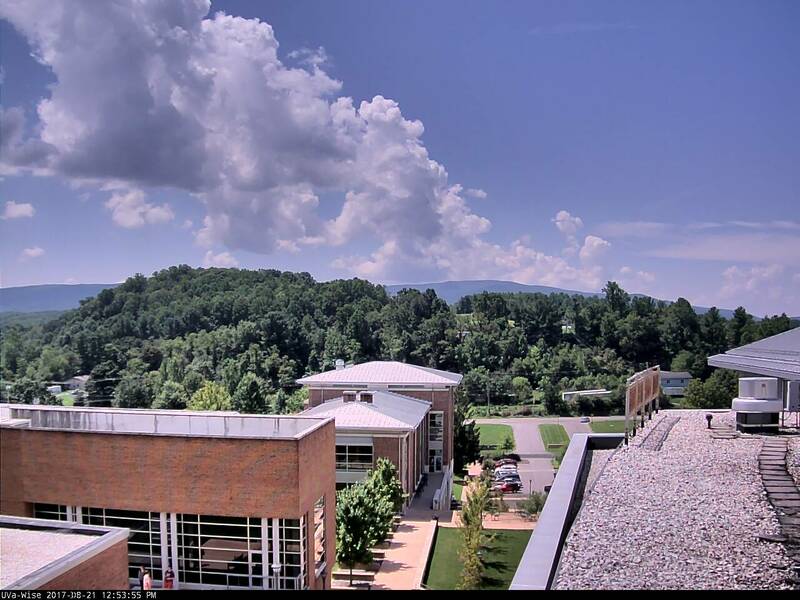 forming along the mountains into mid-day. within the 100% totality corridor. 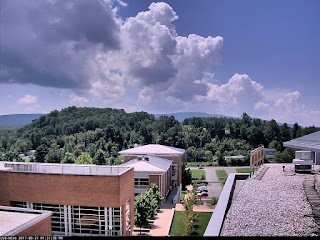 As light returned, it also revealed that much of the cumulus field had dissipated with cooling induced stabilization of the vertical column. 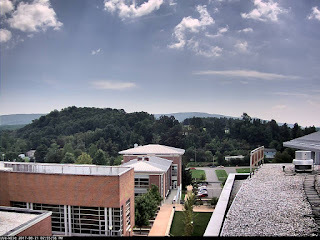 A drop in temperature was notable during the eclipse, with 8.4 degrees ( F ) being observed at the official NWS Cooperative Station in Clintwood. 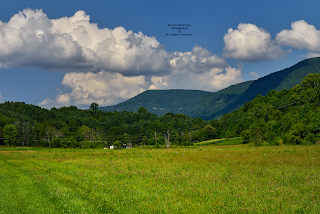 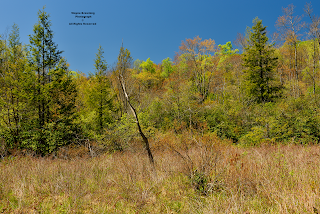 I will be updating this and posting data from the high country of the High Knob Massif later, so please check back to see some of the documented eclipse conditions. 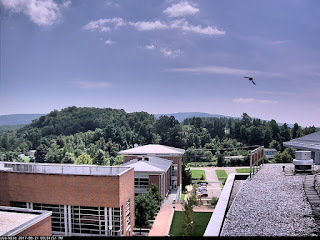 0.4 degree Fahrenheit correction on the HOBO sensor. at 1330 hours ( 1:30 PM ) down to 74.1 degrees by 1450 hours ( 2:50 PM ) as the totality ( 95% in Clintwood ) occurred and began to pass. The pre-eclipse MAX of 82 degrees was the maximum for this date.